Plot numeric, complex, X/Y, or point sample data contained in arrays and analog waveforms. You can plot numeric, complex, or point sample data contained in arrays and analog waveforms. By default, the graph data type is an array of doubles. You can change the data type on the diagram. The waveform data type carries the start time (t0), delta t (dt), and y-values (Y) of a waveform. 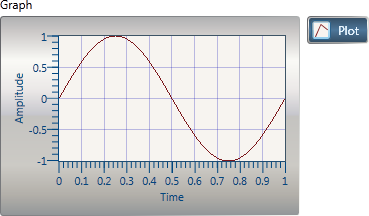 When you wire waveform data to a graph, the graph automatically plots a waveform based on the start time, delta t, and y-values of the waveform. For data contained in arrays, the graph displays a general-purpose Cartesian graph that plots any set of points, evenly sampled or not. The following table describes how graphs plot different types of array data. The cluster is a single plot. 2D array of numeric values Each row of the array is a separate plot. 1D array of clusters of 1D arrays Each cluster of arrays is a separate plot. Arrays within a cluster must be the same size, but arrays in different clusters can be different sizes.